A pin is a small piece of metal used as a fastener or support, as well as many different forms of fasteners, badges, or ornaments made with sharp wires. It is also a short metal, wooden, or plastic rod driven through holes in adjacent parts of something, like the hub of a wheel and its axle, in order to hold those parts together. Informally, legs can be called pins, although this is now rather dated. As a verb, to pin means ‘to fasten with or as with a pin’ and ‘to hold something or someone still in one place.’ Unrelatedly, a PIN is also an identification number that gives you access to an automatic machine or other device. The dress still needs to be stitched; it's only held together with pins at the moment. The journalist wore a decorative pin on the lapel of her jacket. The wheel was attached with a pin. The man was very old and a little unsteady on his pins. The teacher pinned the results to the noticeboard. The police officer pinned the thief to the floor to stop him escaping. If you want to pay by card, you'll have to enter your PIN on the keypad. get pinned (US): this is said about a young woman who receives a male student’s fraternity pin as a sign that the two of them are in a committed relationship. It can also be said about the couple to mean that they have formally pledged their commitment to each other, but have not yet become engaged to be married. This practice is now dated. There are a variety of interpretations of what the lyrics mean, including that it may be a reference to heroin addiction. 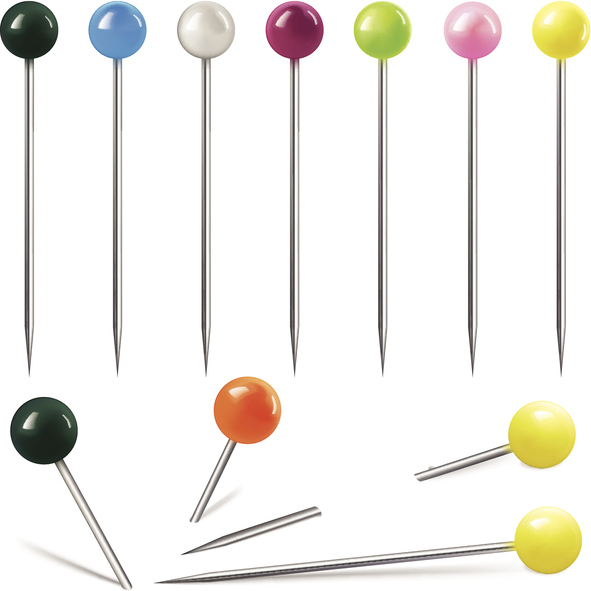 Pin can be used as a suffix with another word that denotes the type of pin it is. Common examples are clothespin (mainly US, this is a pin used to attach washing to a line to dry), hairpin (a pin used to keep hair in place), and tiepin (a pin that attaches a tie to the wearer’s shirt). Pin dates back to before the year 1100. The late Old English pinn and the Middle English pinne meant ‘peg or bolt,’ It can be traced back to the Proto-Germanic root penn– (juttinng point or peak) and the Latin pinna or penna, which could mean ‘a pinnacle,’ ‘a promontory or cape,’ ‘a battlement’ and ‘a point’ (of different types), as well as ‘a feather or plume,’ ‘a wing’ (in the plural), and ‘a fin.’ There is some debate about whether pinna and penna were two variations of the same word with many meanings, derived from the Proto-Indo-European root pet– (to rush or fly), which would make pin related to the English word pen, or pinna and penna were separate, with penna holding the meanings related to feathers, fins and wings, and pinna the meanings related to points and peaks. In this version, pinna is derived from the Proto-Indo-European spei– (sharp point), and is related to the English spike. Either way, pin is definitely related to the Old Saxon pin (peg), the Old Norse pinni (peg or tack), the Middle Dutch pin (pin or peg), the Old High German pfinn and the German Pinne (pin or tack). The modern, thin wire pin dates back to the 14th century, while the figurative use for legs is from the early 16th century. The expression “pins and needles” dates back to the early 19th century. The verb comes from the noun and, meaning ‘to affix with a pin,’ dates back to the mid-14th century. The meaning ‘to hold someone down’ is from the early 19th century.